Two weeks into the Burke trial, testimony began sounding like dialogue from a crime novel - which is why the public couldn't get enough of it. The details of the 1910 crime were horrific enough: Dr. Willard Burke was charged with the attempted murder of his mistress and their infant child - by blowing them up with dynamite. Interest in the crime was also high because Burke, owner of Burke's Sanitarium (an upscale health spa) on the outskirts of Santa Rosa, was very wealthy, very well known, and hardly looked the part of a murderous adulterer; his grey beard stretched to his waist, making him appear even older than his 59 years. But once the trial began, his odd writings about using "various organs and functions" to commune with Life-God and obeying the "voice of Life" through "physical sensations" became known, another aspect of the good doctor's bedside manner was exposed. Add in the equally nutty notions of the nearly-exploded victim Lu Etta Smith - that her child may have been sorta' the result of immaculate conception - and the Sonoma County courthouse became the best show in town. The presiding judge banned minors from the courtroom, and had seat belts existed at the time, he would have ordered spectators to strap down tight for the bumpy ride. But the free-love and metaphysical stuff flamed out (mostly) after that second week and the trial settled into a more familiar battle between a prosecutor and defense attorneys. Witnesses paraded to the stand to recall what they saw or heard or didn't. What emerged from their testimony were a number of surprising clues. Even if you approach the crime as being an open-and-shut case that Burke was guilty of attempted murder, there certainly were others involved in the efforts to cover it up - and maybe were part of the crime itself. Squint at the clues a little closer and you might think there's reasonable doubt Burke had a direct role in the event at all. Newspaper and magazine readers around 1910 were crazy over murder mysteries like the Burke case. A great many people considered themselves armchair detectives able to solve crimes that stumped the experts, pouring themselves over testimony that appeared in the press looking for proof to confirm their theories. Months after the Burke verdict, readers were still sending essays to the Press Democrat presenting alternative versions of the crime. This was also the beginnings of the golden age of murder mystery writing; Arthur Conan Doyle had just re-relaunched his Sherlock Holmes franchise after a four-year hiatus and "The Mystery of the Yellow Room," considered the first and possibly best "locked room" detective story was then being serialized in American papers. Probably everyone had read or heard about Mary Roberts Rinehart's blockbuster bestseller, "The Circular Staircase," which created the "old dark house" genre of mystery fiction, challenging the reader to solve a murder by naming the killer among a number of suspicious people gathered together at the scene of the crime. ALFRED BURKE Manager of the Sanitarium, although his duties seemed minimal and limited to opening the mail, operating the telephone and acting as postmaster for the occasional letter. The 41 year-old brother of Dr. Burke was also a deputy sheriff and handled all evidence before authorities arrived the morning after the explosion. Dr. Burke allegedly complained that he had supported his relatives for years and wished they would go away. AGGIE BURKE Alfred's wife was apparently widely disliked at the Sanitarium. In an incident three months before the explosion she slapped or punched Dr. Hitt twice in the face in front of witnesses, allegedly while she was drunk. She emerged as a spokesperson for the family in the days after the explosion and repeatedly stated Lu Etta Smith was insane and had been attempting suicide with the dynamite before she lost her nerve at the last moment. Alfred and Aggie Burke were the first to reach the scene of the crime after the explosion. DR. ADDISON W. HITT A surgeon and respected authority on leprosy (working first at Indian leper colonies and later lecturing widely on the topic, including 1902 testimony to the U.S. Senate), Hitt was certainly overqualified to be an assistant physician at Burke's Sanitarium. Hitt resigned a few weeks before the explosion and told the jury he left on good terms, but Burke's defense attorney asked if it wasn't true he vowed to "get even with the Sanitarium." Hitt also denied he sought Dr. Burke's permission to place the Sanitarium's name on a patent medicine he intended to manufacture. ABBIE SMITH The head nurse at the Sanitarium was part of Dr. Hitt's extended family, having moved to California with Hitt and his wife. She resigned shortly before Hitt left and was living at the Hitt residence in Berkeley at the time of the explosion. DANIEL WARREN DILLARD The bookkeeper at the Sanitarium had known Dr. Burke for fifteen years. While Burke was at his mine obtaining the dynamite, Dillard wrote him a gossipy letter about the incident between Aggie Burke and Dr. Hitt, emphasizing that he viewed Aggie's "clever rascality" as a destructive force among the staff and patients alike. It was Dillard who initially alerted the sheriff's office about the explosion, for which he was upbraided by Dr. Burke for "exceeding his authority." Dillard quit soon thereafter. EARL EDMUNDS The 19 year-old nephew of Dillard's wife was part of the Dillard household. Earl worked various jobs at the Sanitarium including duties of an orderly, and was chatting with a nurse when the explosion was heard. He quit the following day. MRS. MARIAN DERRIGG A confidant of Dr. and Mrs. Burke, she was seen with them in the months before and after the explosion. It was Derrigg who passed $750 to Lu Etta Smith for passage to Japan, after having her sign several sheets of blank paper that were mailed the District Attorney as typed confessions of Smith's guilt in the explosion. It was said during the trial she had inherited $50,000 or $60,000 earlier that year and was negotiating with Dr. Burke for half interest in the Sanitarium. Her testimony was sought by both sides, but she disappeared before the trial began, only to resurface the day after closing arguments. "Derrigg" was almost certainly not her real name; she had also gone by the aliases of Pierce and Somerville, and had been supported for a number of years by salesman named G. R. Pierce who traveled between San Francisco and Los Angeles. DR. HENRY F. DESSAU An osteopath and assistant physician at the Sanitarium, Dr. Dessau treated Lu Etta Smith's injuries on the night of the explosion and testified they were not life threatening. Dr. Burke told him they didn't need to bother authorities by reporting the incident, as an investigation could be handled internally. 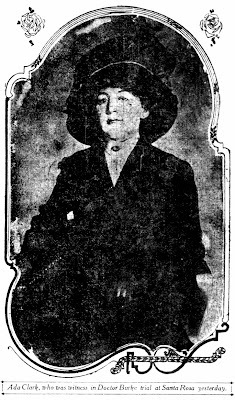 MISS ADA CLARK A nurse who was washing dishes at the time of the explosion and had little to do with the court case aside from being "pretty and petite, more attractive possibly than any other of the female witnesses," as the Press Democrat reporter described her. She was also the only witness (aside from Burke and Lu Etta Smith) to have her photo in the San Francisco Call. Mysteries abound; it's possible to sprout any number of plots from those seeds. Why were problematic relatives Alfred and Aggie Burke - at heightened risk of losing their sinecures - both the first on the scene of the crime to prevent the fire spreading to other tents? Why did the Hitt faction resign just before the explosion? Why did the Dillards leave soon afterwards and why did bookkeeper Dillard rush to notify the sheriff without authority? The defense lawyers repeatedly tried to suggest there was a conspiracy between a bunch of the employees, citing an evening in Berkeley when Hitt and Dillard, along with Ada Clark, Edmunds and Abbie Smith had what the defense claimed was a "meeting" and not merely a social get-together. The defense attorney suggested they anticipated soon gaining control of the lucrative operation, which was not entirely unlikely; Dillard testified that, "Dr. Burke said at one time that if his mine turned out well he intended to turn over the management of the Sanitarium to us three boys, meaning Dr. Hitt, Dr. Dessau and myself." The defense also made much over Dr. Hitt racing back to the Sanitarium the day after the explosion, suggesting his purpose was an emergency confab with Dillard over taking control of the operations. Hitt's withering reply: "I came to Santa Rosa, then, because I thought 'I can save Lu Smith's life.'" Dr. Hitt did in fact believe Lu Etta's life was at risk; he had received a letter from Dillard stating she was expected to die within a few days. But in the letter Dillard also urged Hitt to act fast and contact attorney Naylor to see if anything could be done to oust Dr. Burke if he was not otherwise suspected of the attack. "I believe between all of us we have enough to put him through, or at least break up his infernal damned crime," Dillard wrote. Well, I am nervous. It has happened. Dr. B has been talking to everyone for the past week or so about Lu Smith threatening to blow herself up, and last night at 9:30 o'clock p.m. away it went, either a stick of dynamite or giant powder. My wife and I were in bed reading. We knew instantly what it was. Alfred and Aggie were the first to reach the scene and found the baby all right and Lu Smith miraculously alive and little hurt. Head is cut a little and left arm cut a little. Dr. B. was standing in the kitchen at the time. He was up there during the excitement after the explosion, and said, "Oh, yes; sometimes they get right up and do these things in their sleep--" silly talk. Was disappointed of course. They moved her to another tent. Now Doc dear he says this morning that she has absorbed so much of the poison of the powder fumes that she will probably die within three or four days. Dr. Dessau and I are dubious about it. She is scarcely hurt at all. It has a bad color, his talk. Now can we all stand by and let this fellow finish her up. That's what he means. They haven't notified the sheriff's office yet and they don't intend to. Think I will do it anyhow. It should be investigated. I believe between all of us we have enough to put him through, or at least break up his infernal damned crime. I can't remain here a moment longer than time to get out. Dr. Hitt something must be done. Why let him go on? I feel certain beyond every question of doubt he fired that powder and is disappointed; has even said he was sorry she didn't "finish herself" as he puts it. This institution is rotten with crime and in the sake of humanity and in the sight of an Almighty God lets break it up. Tell Mr. Naylor and let's act. I saw Dr. B. last night at 8 a.m. about, going a dark road towards his tent, but little did I think then he could stoop so low as to try to commit murder. Do not write me here at all. You may phone me up if you like. If you write I may be gone and they would open the letter. Hitt testified that drove his buggy to the Fulton train station and picked up Burke about six weeks before the explosion - and unknown to Dr. Hitt, Burke was then carrying the sticks of dynamite in his baggage. 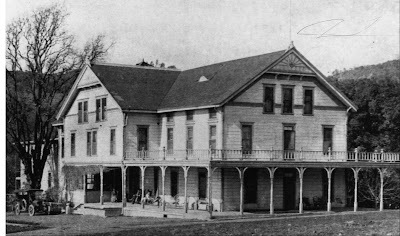 "On the road I told him that there had been quite a commotion at the Sanitarium on account of Lu Smith having telephoned to San Francisco to an attorney. I told him she had claimed that he was the father of her child. I asked him if it was true. 'No,' Dr. Burke replied. 'I am not the physical father; I may be the spiritual father, as Lu Smith looks to my higher plane of mentality and believes that.'" Hitt also suggested to him that Lu might be better off at an asylum or institution. Burke replied, "We can't very well do that." Burke also commented that Lu and her child would be "better off dead." Conditions here are drifting closer to the dangerous shore, I fear, as Dr. Burke has repeated several times that Mrs. Lou Smith is trying to get some dynamite out of our cases and has threatened to blow herself and child to atoms. This does not sound just right to me and Miss Smith agrees with my opinion in the matter. I trust no tragedy is to take place as it would be a terrible thing. Dr. Burke wasn't confiding his fears to Hitt exclusively; it seems in the weeks and months before the incident he was apparently blabbing to everyone who would listen that Lu Etta would someday turn up exploded. The crisis was always right around the corner; Dillard recalled he had upwards of a hundred conversations with Burke regarding her mental state, and he always said she was getting worse. But if he always planned to kill her, why the delay? Over six weeks passed between the time he returned from his mine with the dynamite and the attempted murder. District Attorney Lea called to the stand Gilbert Boalt, who was staying at the Sanitarium the night of the explosion. He testified that he saw Dr. Burke the next morning and he appeared very nervous, with shaking hands and avoiding eye contact. Boalt knew why Burke was uneasy - at that moment, Lu Smith was on the telephone to attorney Charles Stetson Wheeler in San Francisco. Boalt knew this fact because he was there acting as a lawyer working for Wheeler. Lea revealed the cornerstone of the prosecution's case: It was the unexpected arrival of Boalt that caused Burke to panic and attempt to murder Lu Etta Smith that very evening. If she had retained Wheeler's firm to bring a damage suit against him, all of Burke's secrets were bound to tumble out. Wheeler was likely the most renowned attorney on the West Coast and prominent in state and national Republican party politics; he was the personal lawyer for Phoebe Hearst, a Regent of the University of California, and a leader in the group of prominent men who took charge of the reconstruction of San Francisco after the 1906 earthquake. Dr. Burke must have realized he had no chance of mounting a defense against such a legal powerhouse. And surely Lu Etta was planning to depart with Boalt, possibly as early as the next morning. With the court soon to adjourn for New Year's, the District Attorney left the jury with a clear motive to ponder during their week off. And you can also bet every armchair detective following the trial sighed in deep satisfaction: The "A-ha!" moment was now revealed.